I love the design and weight of this pedal. However, for this entire summer I have been fighting an obnoxious clicking noise in rhythm with my cadence. I was convinced that it was my Cannondale BB30 bottom bracket and had it taken apart and cleanedgreased three times this summer, but the noise continued. I then replaced my seat and cleaned and re-greased my seatpost, but the noise continued. Finally, I tried switching out my Blade pedals, and the noise stopped. I replaced the Blades with Keo Classic 3's, and no noise. It took me 4 months to solve this problem. I have a 1 yr old pair of Blades if anybody wants them. I've been using various Look pedals for the past 10 years and these are the best. Light and easy to clip in & out of. Highly recommend. Just purchased a new hi modulus carbon bike and these pedals were the finishing touch. 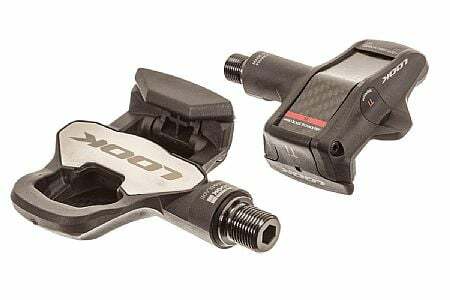 I was struggling to find a lightweight pedal with a traditional cleat and had considered Speedplay to reduce some weight. However, once I saw the new Look Keo Blade 2 Ti, I wanted to give them a try. At 90 grams per pedal and a very simple clip, this has been an awesome pedal!! I have 5 bikes with these pedals. They are the best out there and perform flawlessly every ride. Good, almost great read why!